Opening on 26 October 2018, IMMA is delighted to present two major solo exhibitions, Voyages by Irish born modernist master Mary Swanzy (1882 – 1978) and Rebuilding the Future by internationally renowned German artist Wolfgang Tillmans. The exhibitions will be opened by Minister for Culture, Heritage & the Gaeltacht, Josepha Madigan T.D., on the evening of Thursday 25 October 2018 and will open to the public on Friday 26 October at 11.30am. These two IMMA initiated exhibitions exemplify the breadth of the museum’s programme. Mary Swanzy is arguably Ireland’s first ‘modernist’ painter and this is the first major retrospective of her work since 1968. This exhibition aims to reintroduce audiences to Swanzy’s extraordinary achievements and reinstate her as a Modern Irish Master. Wolfgang Tillmans’ relationship with IMMA began over 20 years ago, when he first exhibited work at the museum in 1997 as part of a group exhibition of young emerging artists Projects and more recently in 2015 in the popular exhibition What We Call Love: From Surrealism to Now. This is his first solo exhibition in Ireland and he has created this exhibition specifically for the IMMA galleries. It follows his critically acclaimed solo show in Tate Modern, London in 2017. Mary Swanzy (1882-1978) is a unique Irish artist. Her level of achievement, world travel and original thinking is unmatched in Irish art, yet this is the first retrospective of her work in 50 years. Born in the late Victorian era, by her early twenties Swanzy had mastered the academic style of painting. She witnessed the birth of Modern art in Paris before the First World War and her work rapidly evolved through the different styles of the day, each of them interpreted and transformed by her in a highly personal way. In 1920, against the background of violence of the Irish War of Independence, she left Ireland in a form of self-imposed exile. Traveling first through Eastern Europe and the Balkans, she then sailed to Hawaii and Samoa from 1923 to 24 – literally crossing the globe. While there she produced a body of work that is unique in an Irish context with images that show her proto-feminism and critique of the colonial system. Best known for her Cubist and Futurist paintings, after 1914 she exhibited regularly at the Paris Salon des Indépendants and the Beaux Arts, alongside artists who are now household names. By 1946 she was included in exhibitions with Chagall, William Scott and Henry Moore but after this time her work fell into obscurity. This may in part have been due to her status as a female artist and indeed she was vocal on issues of gender, remarking; ‘if I had been born Henry instead of Mary my life would have been very different’. This exhibition aims to introduce audiences to her extraordinary achievements. Wolfgang Tillmans (b. 1968, Remscheid, Germany) is one of the most accomplished and widely celebrated artists working today, recognised for major contributions to the development of contemporary photography in terms of subject matter, production, scale, presentation and methodology. Rebuilding the Future comprises over 100 works and captures Tillmans’ unique way of working. This new exhibition for IMMA mixes works from throughout his career and in numerous formats, installed in IMMA’s galleries in direct relation to the physical spaces and atmosphere of the museum. While primarily a lens-based artist, Tillmans also works in a variety of other media. The exhibition includes works on paper made with and without a camera, sound work, moving image works and installation. Also central to Tillmans’ practice is the prolific production of books, catalogues and magazine editorials, and more recently, live and recorded music. An immersive new sound work, I Want to Make a Film (2018), which engages with concerns over the speed and development of personal technology and its effects, is shown here at IMMA for the first time. Rebuilding the Future includes work that is concerned with the process of time, whether it be measured through people or places. The exhibition functions as an open question for the audience to interpret. This broad range of subject matter is reflected in the variety of production and display methods seen in the exhibition. In this, as in all exhibitions produced by Tillmans, the work is selected and installed to reflect both the nature of the physical space and Tillmans’ immediate concerns at the time of the exhibition. Tillmans will give an artist talk about his work prior to the exhibition opening, on Saturday 20 October, in partnership with NCAD. Please see details below under Associated Talks & Events or visit the booking page for details. A fully illustrated monograph accompanies the Mary Swanzy exhibition with text by Seán Kissane, Curator: Exhibitions, IMMA, and a biography by Liz Cullinane, artist and researcher. An exhibition poster designed by artist will accompany the Wolfgang Tillmans exhibition. An exhibition catalogue will also be published in the coming months. All exhibition merchandise will be available to purchase from the IMMA Shop. Mary Swanzy, Voyages, is curated by Seán Kissane, Curator: Exhibitions, IMMA. Voyages is presented as part of the Modern Masters Series and will travel to the Crawford Art Gallery, Cork and Limerick City Gallery of Art in 2019. Wolfgang Tillmans, Rebuilding the Future, is curated by Sarah Glennie, Director, National College of Art and Design and Rachel Thomas, Senior Curator: Head of Exhibitions, IMMA, in close cooperation with the artist. Mary Swanzy (1882 – 1978) was a pioneering figure in Irish art. Born in Merrion Square in 1882 she was educated in Dublin, Germany and Paris at the turn of the last century. There she witnessed the birth of Modern Art and after 1914 exhibited at the Paris Salons alongside those modern artists who are now household names. She mastered the academic style of painting at a young age and her work rapidly evolved through different styles: Post-Impressionism, Fauvism, Cubism, Futurism, Symbolism and Surrealism; each of these interpreted and transformed by her in a highly personal way. Very widely travelled and well educated, she spoke several languages and had seen much of Europe by the age of twenty. Following the devastation of the First World War she went to Czechoslovakia as an aid worker and travelled widely in the region. In 1923 she literally crossed the world on an epic voyage to Hawaii and Samoa producing a body of work that is unique in an Irish context. Throughout the 20s and 30s she exhibited in the USA, Hawaii, UK, Belgium, Ireland and regularly in Paris at both the Salon des Indépendents and the Beaux-Arts. In 1920 she was elected to the committee of the Paris Indépendants and she also participated in the founding of the Society of Dublin Painters – Ireland’s first Modern Art gallery; and participated in the first Irish Exhibition of Living Art. In 1946 she was included in a group exhibition in London with Braque, Vlaminck, Dufy, Chagall, William Scott and Henry Moore. This record of achievement is unsurpassed by her better-known contemporaries yet there has not been a substantial exhibition of Swanzy’s work in Dublin since her 1968 Retrospective at the Municipal Gallery. Artist and researcher Liz Cullinane draws on her biographical investigations into Swanzy’s life long career and shares some of the most intriguing discoveries to emerge out of the artist’s own records, archives, and accounts from those closest to her. This talk explores a selection of works some of them comprising several rooms of the IMMA exhibition. Karen Sweeney, Exhibitions, IMMA, presents a walkthrough on the key themes and artworks featured in the major retrospective Mary Swanzy, Voyages. Selena Daly, social and cultural historian and Lecturer at Royal Holloway, University of London, discusses the shaping of Swanzy’s Modernist Aesthetic from the context of her acclaimed monograph Italian Futurism and the First World War, 2016. 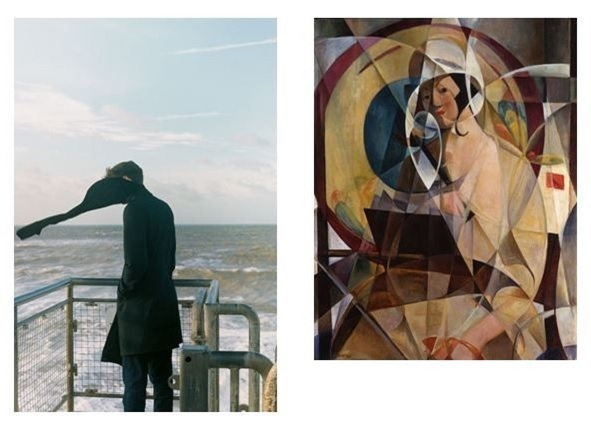 Reflecting on Swanzy’s first-hand encounters of Futurism in Italy, Daly traces Swanzy’s Futurist’s connections, as well as the movement’s reception in Ireland, during a period when Irish society was undergoing huge social and political upheaval. Examining the reception of Mary Swanzy’s work in Ireland and beyond, a panel of art writers, curators and academics come together to bridge existing art criticism with new research to emerge out of the staging of a major retrospective since the artist last exhibited in Ireland 50 years ago. This seminar / roundtable discussion delves deeper into archival materials and art contexts, to position Swanzy’s oeuvre within current discourses on Modernist art in Ireland, the place of women as artists and revolutionaries in Irish Modernism, and the role of censorship, ideology, cultural bias and displacement plays in historicising of an artist of Swanzy’s significance in Ireland. Chaired by, Dr. Róisín Kennedy, Lecturer, School of Art History and Cultural Policy, UCD, a dynamic panel of speakers will be announced shortly. IMMA and NCAD are delighted to present an artist talk from internationally renowned artist Wolgang Tillmans, in advance of his much anticipated IMMA exhibition Rebuilding the Future, opening on 26 October 2018. This keynote talk from the artist will take in his most recent projects – delving deeper into the socio-political concerns that drives an expanded practice of photography, activism, publishing, performance, music and installation. Tillmans will be introduced by NCAD Director Sarah Glennie, co-curator of the IMMA exhibition. See the IMMA website for a full programme of talks on this series. Advance booking is essential. Tickets will be available from the IMMA Talks section of our website. All talks are free but ticketed unless otherwise stated.